The two phenomena based on straight light propagation are reflection and refraction, wherein the reflection deals with the bouncing of light rays whereas the refraction talks about bending of light rays. Our world is full of objects that we can see only with the help of light. If there is the absence of light in a room, nothing is visible to us. Have you ever wondered, how can we perceive things with eyes? In the daytime, it is the light rays coming from the sun, that help us to see objects, i.e. as the light rays fall on it, the object reflects light, which when received by our eyes, the object becomes visible. Likewise, there is a diverse range of phenomena concerning light that can be explored with the help of a thorough study. Meaning Reflection is described as the reverting back of light or sound waves in the same medium, when it falls on plane. Refraction means the shift in direction of the radio waves, when it enters medium with different density. Medium Light returns to the same medium. Light travels from one medium to another. Waves Bounce off the plane and changes direction. Pass through the surface, that changes their speed and direction. Angle of incidence Equal to the angle of reflection. Not equal to the angle of refraction. The angle of incidence is identical to the angle of reflection. The ray of incidence, ray of reflection and the normal drawn at the point of incidence, to the mirror, occurs at the same plane. 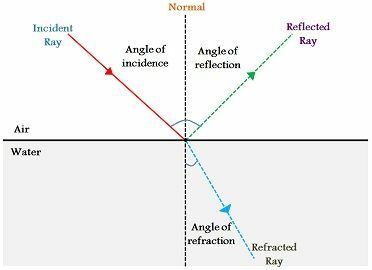 Regular reflection: Otherwise known as specular reflection, which occurs when the beam of light falls on a regular, polished and smooth plane, such as metal or mirror, reflects light at the same angle as it is incident to the surface. Refractive index is the ratio of the angle of incidence to the angle of refraction. It ascertains the speed of a ray of light in the new medium, i.e. the denser the medium the slow is the speed of light, and vice versa. Hence, the degree of bending vests on the refractive index of the two media. The reverting of light or sound waves in the same medium, when it falls on the plane, is called reflection. The shift in the direction of the radio waves, when it enters medium with different density, is known as refraction. In reflection, light ray falling on the plane returns to the same medium. Conversely, in refraction, the ray falling on the plane travels from one medium to another. In reflection, the waves bounce off the surface. On the contrary, in refraction, the waves pass through the surface, that changes their speed and direction. In reflection, the angle of incidence is same as the angle of reflection. As against this, the angle of incidence is not similar to the angle of refraction. Reflection takes place in mirrors, while refraction occurs in lenses. All in all, reflection and refraction are two basic facts associated with light, which are studied along. Reflection is when the light goes back to the previous medium, but changes direction. On the flip side, Refraction is when the light is absorbed by the medium, but the direction and speed are affected.